Place de la Contrescarpe is the axis of a large, formerly working-class district, the ancient Faubourg Saint-Médard, gentrified, but still colorful, that spreads to the south on both sides of the market street Rue Mouffetard. In the Middle Ages the area lay outside the walls of the city. It has long been a haven for outsiders, real and fictional. François Villon caroused at the taverns outside the Porte de la Bourdelle, the gate to the road to Lyon, in the fifteenth century, when the little plateau which is now Place de la Contrescarpe teemed with the activity of travelers, stable hands, traders, teamsters, and sedan chair porters. The most popular tavern was the Maison de la Pomme de Pin, where students and fellows came to drink cheap, untaxed wine. Rabelais drank at this tavern in the early sixteenth century, and a few years later Pierre Ronsard, Joachim du Bellay, and fellow poets formed the Pléiade to promote the controversial idea that French was as legitimate a language for poetry as Latin. For the past forty years the elderly Madame Vauquer, née Conflans, has kept a boarding house in the Rue Neuve-Sainte-Geneviève between the Latin Quarter and the Faubourg Saint-Marcel. Rue Neuve-Sainte-Geneviève is now Rue Tournefort, and the model for Mme Vauquer's pension bourgeoise in Le Père Goriot is down the hill. Most literary archaeologists agree it is the tall, plain, cream-colored house at No. 30. By the time the novel came out in 1834, Balzac had been living nearby on Rue Cassini for five years, and insatiable flâneur that he was, he knew "the grimmest quarter of Paris," as he calls it, inside out. Balzac took an intense interest in people's surroundings, not merely to use for colorful literary setting, but because he saw the environment both as a molding force and an extension of personality. The odious Mme Vauquer is a perfect example: "The unwholesome plumpness of this little woman is a product of the life she lives here, by the some process that breeds typhoid fever from the noxious vapors of a hospital." Two of the most vital characters in Balzac's vast series of novels La Comédie humaine first appear in Le Père Goriot: the law student Eugène de Rastignac, the quintessential young man from the provinces come to make it big in la capitale; and the sinister Vautrin, strangely drawn to the handsome young Rastignac (Balzac giving the first hints of homosexuality in French fiction). Vautrin is eventually unmasked as a notorious criminal. Everything revolves around money, which is another idea Balzac introduced to French fiction. During the Bourbon Restoration, when the story takes place (1819 is the year Balzac specifies), after the successive collapses of the aristocracy of the ancien régime and the new Napoleanic nobility, money emerged as the one source of real power. Rastignac sees this force cruelly at work in the fate of Goriot, an old fellow-boarder he befriends and tries to help, who is being bled dry of his retirement funds by his glamorous daughters. But despite the money-grubbing and social-climbing that Rastignac sees all around him and finds disgusting, he cynically plunges into the fray. From the summit of the aristocracy to the lower depths of the plebian, all the actors of his Comédie are more greedy for life, more active and cunning in the struggle, more patient in misfortune, more gluttonous in pleasure, more angelic in devotion, than the comedy of the real world shows them. In short, in Balzac, even the door-keepers have genius. All his souls are loaded to the muzzle with will. Just like Balzac himself. Unlike Balzac, Victor Hugo could not roam the streets while he was writing Les Misérables in the 1860s. The giant of French letters was then living in self-imposed exile on the Isle of Guernsey. But he had explored every corner of the city during the period the story unfolds, from 1815 to the early 1830s, and a relief map was etched in his heart. Hugo follows his characters virtually block by block in this immense, sprawling novel, naming the streets they traverse, and the landmarks they come upon, including the moody fifteenth-century church of Saint Médard at the foot of the Rue Mouffetard food market. After escaping Thénardier's clutches, Jean Valjean and little Cosette are holed up in a hovel at No. 50–52 boulevard de l'Hôpital. Valjean often visits the church of Saint Médard. He goes at dusk, when the area is almost deserted. His generous nature gets him into trouble, however, when the curiosity of the locals is aroused by the sight of this big man in a threadbare yellow coat and battered hat giving handouts to beggars. Inspector Javert, ever alert to possible sightings of his prey, disguises himself as a clochard and squats in front of the church to spy on "the beggar who gives alms." Emerging from the church and placing a coin in the disguised inspector's hand, Valjean gets a split-second glimpse of what he thinks is the "terrible and familiar countenance" of Javert. The resourceful ex-convict tracks Javert to the police station, then immediately sets out with Cosette on their night flight from the Left Bank, with Javert and his men at their heels.
. . . And in that poverty, and in that quarter across the street from a Boucherie Chevaline and a wine-cooperative he had written the start of all he was to do. There never was another part of Paris that he loved like that, the sprawling trees, the old white plastered houses painted brown below, the long green of the autobus in that round square, the sudden drop down the hill of the rue Cardinal Lemoine to the River, and the other way the narrow crowded world of the rue Mouffetard. Hemingway was twenty-two, his wife Hadley twenty-six, when they moved to No. 74 rue du Cardinal-Lemoine, three weeks after arriving, on January 9, 1922. By then he was already cultivating his diamond-in-the-rough persona, and it suited him to be living among real people, rather than the eggheads in the Latin Quarter or the expatriate phonies in Montparnasse. The plain old apartment building is still there, with a plaque commemorating the stay of the future Nobel Prize winner. He and Hadley lived in a two-room cold-water flat on the fourth floor (troisième étage), WC down the hall. "We could not afford a dog nor even a cat then," Hemingway writes in A Moveable Feast. But in fact, between his earnings as a correspondent for the Toronto Star and Hadley's revenue from her trust fund, their income was on a level with the French middle class ($5,000 a year, out of which they were paying $18 a month rent). Skiing vacations in the Alps, fishing and bullfighting trips to Spain, and outings to the racetrack were perfectly within their reach. They dined out often, though usually at cheap places because Hem was a tightwad. Gertrude Stein and Alice B. Toklas paid them a visit in March 1922, and Hemingway gave Miss Stein all the fiction he had written up to this point. Stein objected to his use of dirty words in his story "Up in Michigan." She said they made the story "inaccrochable," a term art dealers use about paintings that cannot be hung in a show. The dirty words stayed put. But he took her advice about a novel he had begun: "Begin over and concentrate." He waited three years before starting to write The Sun Also Rises. A plaque on the wall by the gateway at No. 71 rue du Cardinal Lemoine, one block downhill from the Hemingways' place, honors Valery Larbaud, who had an apartment here from 1919 to 1937. Larbaud was one of the leading French men of letters, a novelist (most notably of The Diary of A. O. Barnabooth), poet, critic, translator, and travel writer extraordinaire. This bear of man, wealthy and known for his generosity, was a close friends with Adrienne Monnier and Sylvia Beach. Beach introduced him to James Joyce on Christmas Eve, 1920. The following summer, Larbaud loaned his apartment to Joyce and his family in order to provide the solitude Joyce desperately needed to finish Ulysses. The house is at the end of a long driveway with ivy-covered walls, set in a leafy, private residential square of rather English allure. Larbaud's spacious ground-floor flat was in the building facing one slightly to the left of the entrance to the square. Joyce completed Ulysses in September 1921, and Larbaud began translating it into French, a labor almost as Homeric as Joyce's. I would stand and look out over the roofs of Paris and think, "Do not worry. You have always written before and you will write now. All you have to do is write one true sentence. Write the truest sentence you know." So finally I would write one true sentence and go on from there. 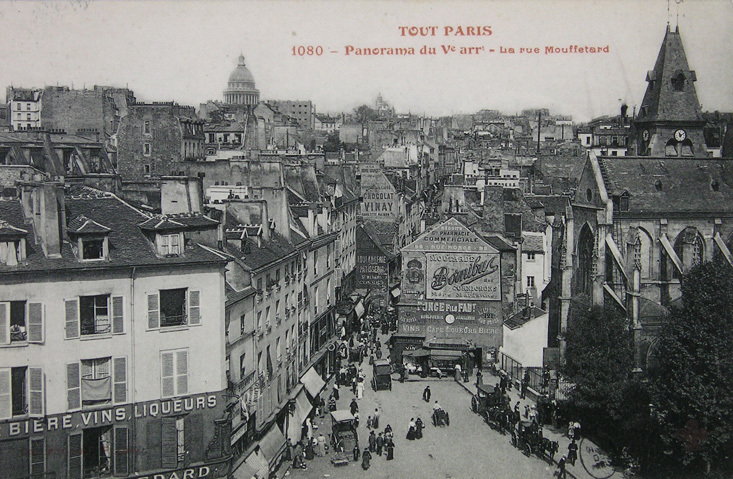 Rue Mouffetard was so-named because of the mouffle, Old French for stink, that came from the river Bièvre at the foot of the hill, where skinners, tanners, and tripe butchers plied their pungent trades until the city paved it over at the end of the nineteenth century. 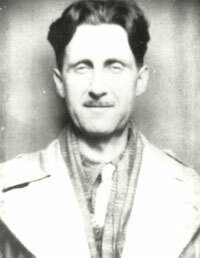 This is Orwell country, the area he wrote about in Down and Out in Paris and London. Whereas Hemingway romanticized his "very poor but very happy" life as a young writer among the colorful poor of the area, Orwell exaggerated the grimness of the place, and the futility of his and the denizens' struggles.
. . . a ravine of tall, leprous houses, lurching toward one another in queer attitudes, as though they had all been frozen in the act of collapse. All the houses were hotels and packed to the tiles with lodgers, mostly Poles, Arabs and Italians. At the foot of the hotels were tiny bistros, where you could be drunk for the equivalent of a shilling. On Saturday about a third of the male population of the quarter was drunk. There was fighting over women, and the Arab navvies who lived in the cheapest hotels used to conduct mysterious feuds, and fight them out with chairs and occasionally revolvers. , most unforgettably as a dishwasher in the none-too-sanitary bowels of a luxury hotel. To avoid embarrassing his father, a retired colonial administrator, Eric Blair decided to use a pseudonym when Down and Out in Paris and London was published in 1933, choosing the name of a small river near his parents' home in East Anglia. He intended to use "Orwell" only for this book, but the reviews were so good and the sales so unexpectedly healthy that the pseudonym became too valuable to abandon.